Since there seemed to be a number of people interested in this pavlova that I posted on Instagram a couple of weeks ago, I finally had time to write up the recipe! The recipe is a combination of many recipes, but was really the result of having a large amount of egg whites left over from making ice cream, and 2 pounds of cherries to use up. The egg whites are weighed in this recipe because I had a big container of them, so I have no idea exactly how many egg whites are in 200 grams (maybe 6?). Hope you enjoy making this as much as I did! Preheat the oven to 250° F. Cover a baking sheet with parchment, and trace a 7-inch circle on the parchment, allowing for some extra room for the pavlova to spread a bit. Spray the parchment lightly with nonstick cooking spray, and dust it with powdered sugar. Place the egg whites and salt in the bowl of a stand mixer. Using the whisk attachment, begin whipping the egg whites on medium-high speed. Once the egg whites foam up, begin to slowly add the sugar. You should be adding the last of the sugar as the whites begin to form stiff peaks. When you get to that point, whip the meringue for a minute or two more, just until they are glossy and stiff. Next, add the vinegar and sift the cornstarch over the meringue. Whisk again just enough to incorporate both ingredients. Spoon the meringue into your 7-inch circle. Being careful not to overwork the meringue, shape it into the shape of a cake, with straight sides and a flat top, making the sides of the cake slightly taller than the center. Once the meringue is smoothed out and shaped, place in the oven. Bake for 1 hour and 15 minutes. Then turn off the oven and leave the pavlova in the oven for an additional 2 hours. In the meantime, combine the pitted cherries and ¼ cup of sugar in a skillet and cook on medium heat until the cherries have softened and there is fair amount of liquid in the pan. Remove from heat and pour into a bowl to cool. When the meringue is finally done cooling, you can make the whip cream. Whisk the cream and powdered sugar together until you have soft-medium peaks. Carefully lift your pavlova off of the sheet pan and onto a cake stand or platter. (A very large spatula comes in handy for this). Dollop some of the whipped cream over the top of the pavlova, then pour the cherry compote over that. 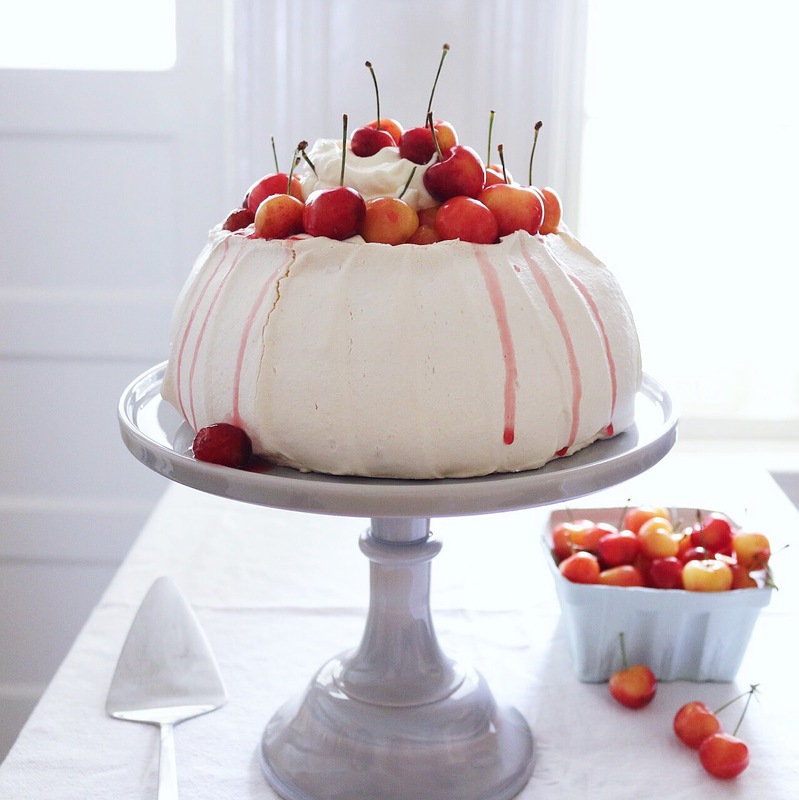 Top with more whipped cream and the fresh cherries. Serve immediately. Once you have added the toppings to the pavlova, it will quickly start to break down. I have egg whites just hoping to be used for pavlova, and I remembered this beauty! I like your addition of powdered sugar to the parchment. Looks stunning!